Published on Tuesday, September 13, 2016. This article appears in the August/September 2016 issue of American Craft Magazine. These coveralls of Japanese cotton (right), along with the red overalls seen from the back, are from Weiss’ new unisex line. The designs reflect her goal to make clothing that looks good on everyone – regardless of age, size, or gender. Debra Weiss, 60, traces her entrepreneurial and designer roots to the 1970s, when the lifelong Los Angeleno would go to Venice Beach to sell the macramé goods she made. But even after earning a degree in textile design at the University of California, Davis, in 1977, Weiss “never thought that creating art could be a living,” she says. She went on to become an X-ray and ultrasound technician, primarily in obstetrics, while raising three daughters on her own. 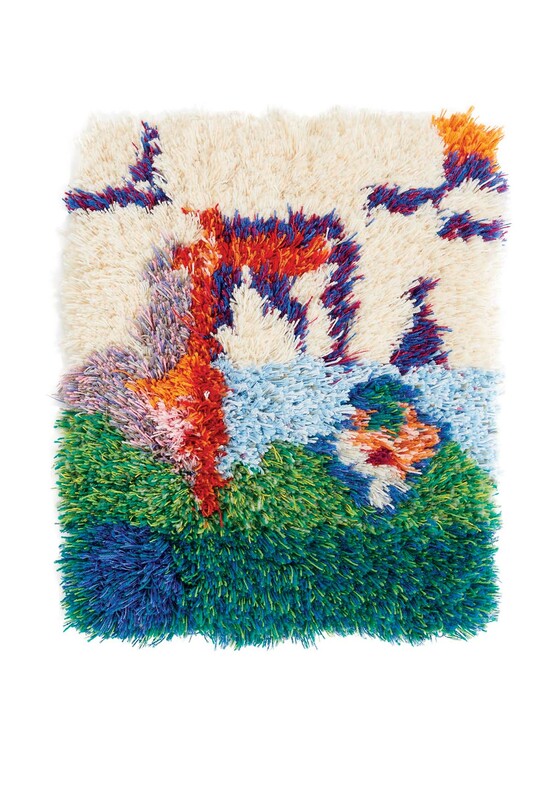 All the while, she continued to dabble in fiber art and also made clothing for herself and her family. It was Weiss’ oldest daughter, Hillery Sproatt, who inspired her mother in 2000 to take her creativity more seriously. “I saw Hillery draw and do artistic things, and I wanted to encourage her to go after her passion,” Weiss says. “Then I thought, if I’m encouraging her to go after what she has talent for, what am I afraid of for myself?” Spurred by her daughter’s example, she started the label Rebe. Weiss eliminated those obstacles in 2007, when she left her medical job to turn her full attention to her craft. 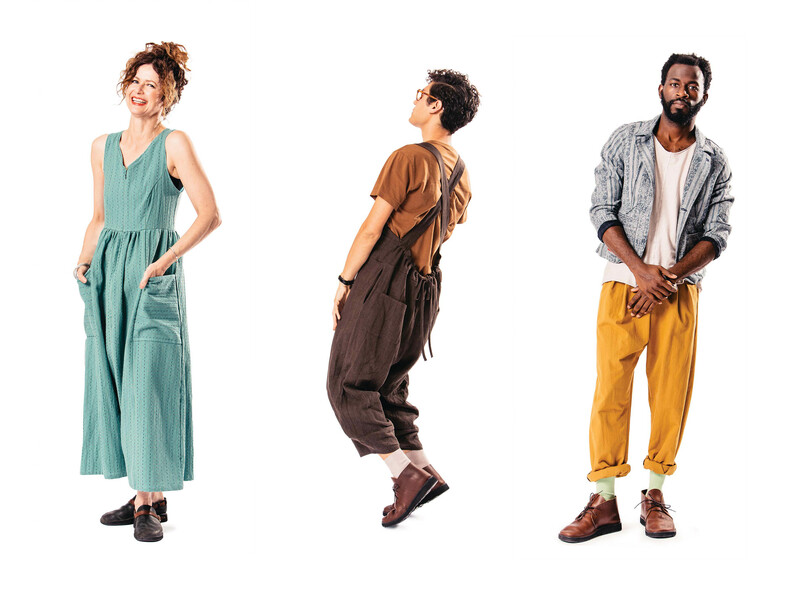 She now designs women’s pants, tops, dresses, and overalls that wrap around bodies like flowing canvases for an earthy, bohemian look; this year she debuted a unisex line. She sources much of her cotton and linen from Japan, and hires patternmakers and sewers to help with production. But Weiss hand-stitches details such as lined pockets, pleats, and darts, to add texture and sophistication. Case in point: She and Sproatt, now 31 and living in Chicago, wear the clothing nearly every day. (Her other daughters also sport select pieces.) It’s a joke among Weiss’ friends that whenever they’re out with her, someone will stop Weiss to compliment her outfit – and ask where she got it. Weiss also continues to make colorful fiber accessories and macramé pieces. 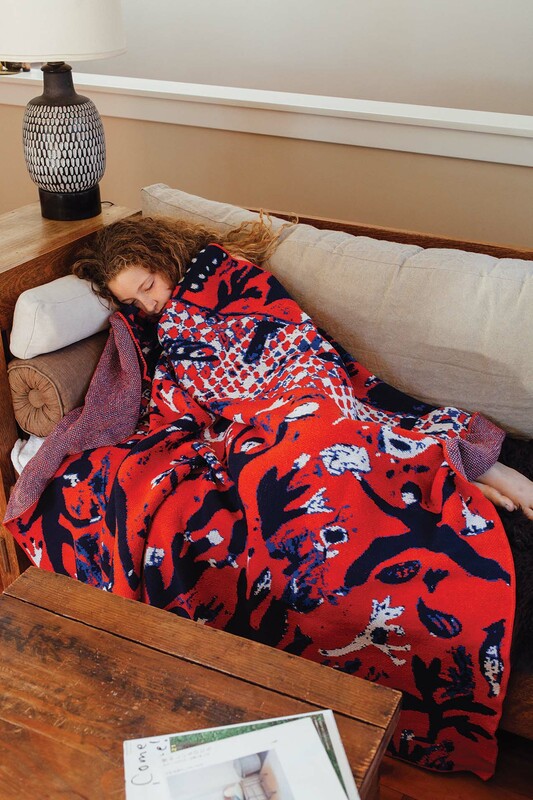 Sproatt, an artist who has worked in painting and fiber sculpture, recently introduced a line of blankets that translate her paintings into textiles. They often share booths at craft shows, and Sproatt manages Specks & Keepings, the online shop they opened in 2011. Weiss, having established her clothing line, is looking forward and in some ways back – she’s working on an installation using macramé rope that would fill a gallery space. Diane Daniel is a writer based in Florida and the Netherlands. Debra Weiss uses natural fibers to create clothing that blends artistry and function. Her offbeat, comfortable looks riff on practical workwear – with plenty of pockets. Weiss began her textile career in macramé. Her latch-hook work After Gee’s Bend (2014) continues her nonfunctional textile experimentations. 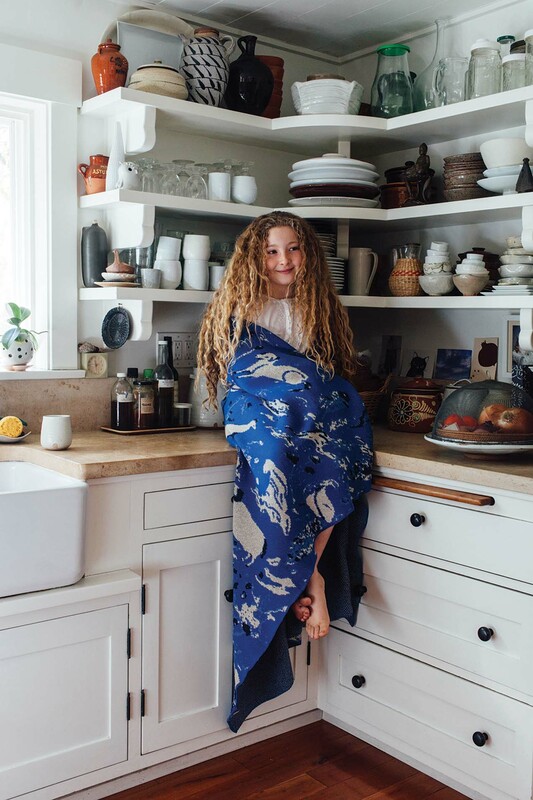 Weiss’ daughter Hillery Sproatt translated her paintings into blankets and added them to Specks & Keepings, their online shop.